Read about all of the programs that Crash Rhythm offers to find out which is the right one for you. Register for Fall programs below! Crash will come to your class, your company or your camp to run an hour or 2 hour session of making music. 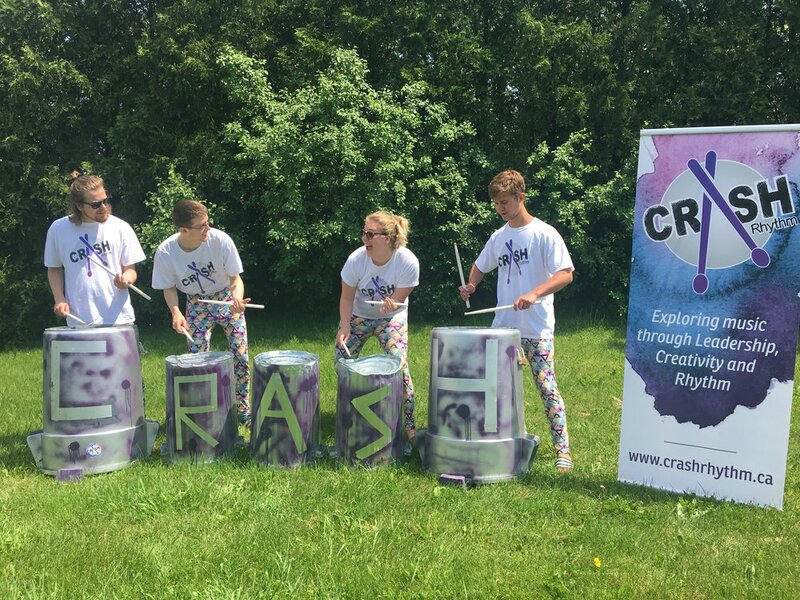 These presentations are tailored to the group and can feature aspects such as music education, ensemble work, leadership opportunities, world drums or songwriting.Each session starts with a percussion performance by either the Junk Line (read below) or Crash founder Hilary Whiskin. Any demographic is welcome to inquire. Past presentations have included special needs classrooms, retirement communities, summer camps and after school programs. Anything is possible and any group can be accommodated. To find out more email Hilary Whiskin at hilarywhiskin@crashrhythm.ca. Crash offers group classes located in downtown Burlington and throughout the GTA. Students range from 7-9 or 10-12. Each class focuses on bringing music and fun together. Students will learn musical creativity through improv and song writing, Students will learn leadership through leading the group in conducting and composing while also learning the basics of reading and writing music. This 9 week program runs in the fall and winter. Students can look forward to recieving their own set of drumsticks, customized bucket and "homefun" booklet, while parents can look forward to a concert at the end of each program. One of our motos is that it is never too late to learn an instrument. If you want to learn how to read music, improve your rhythm, work on your improv or just need a creative outlet then Crash Adult program is for you. No experience necessary, each session is tailored to the members of the group. Adult sessions will feature a percussion performance, a primer in music, songwriting and a lesson in world drums. For more information call hilary at (905) 220 0212 or email at hilarywhiskin@crashrhythm.ca. Learn basic percussion rudiments with their own "sticks and drum pad/bucket"
Through these aspects of the workshop, new skills are learned together in creating a final "product". A copy of the group's overall composition is produced for framing in the office with the title of the piece chosen by the participants. A great memory of the teamwork generated during the workshop to be carried forth into the workplace. Sessions can be modified for any number of participants and can range in length to accommodate the needs of the group. CRASH can come to the office for an afterwork or lunch session or be part of an offsite retreat or conference or new product launch meeting. Each corporation's mission statement and values are INCORPORATED into the presentation. Contact Hilary Whiskin at 905-220-0212 or hilarywhiskin@crashrhythm.ca to book your corporate workshop. Hilary Whiskin has been teaching percussion lessons for over 10 years. As a grad in music and communication studies Hilary is well versed in all that is percussion and rhythm. She has taught drums as a member of the Burlington Teen Tour Band and as the music coordinator at the Port Nelson United Church Glee Camp. Students can learn snare drum, drumkit, music theory and composition techniques. All ages and all experiences are welcome! To learn more email Hilary Whiskin at hilarywhiskin@crashrhythm.ca. The Junk Line is a garbage can entertainment drumline. This group of skilled musicians entertain the crowd by playing difficult and upbeat rhythms on garbage cans. Past performances include sporting events, street festivals, Crash rhythm workshops and the 2015 PanAm games entertainment zone. If you are looking for some fun entertainment at your event then email Hilary Whiskin at hilarywhiskin@crashrhythm.ca.